The 30,500 traffic jams on Welsh roads in 2017 cost drivers and the Welsh economy almost £278m, traffic data has shown. Wales' longest sustained traffic jam of 2017 was a seven-hour, 10-mile (16km) queue on the M4 motorway on 27 October. The westbound Brynglas Tunnel on the M4 at Newport is Wales' worst hotspot, averaging a queue more than once a day. Traffic analytics firm Inrix said westbound congestion at Brynglas cost motorists £14m in lost time. Inrix chief economist Dr Graham Cookson said: "Nothing is more frustrating than sitting in traffic. "Inrix Roadway Analytics shows it's a costly activity generating more than £278m in economic impact for Welsh drivers in 2017. "Jams can be caused by all kinds of incidents but Inrix shows that accidents contributed to the biggest pile-ups in Wales this year." Inrix figures showed Wales suffered, on average, 84 jams a day from a total of 30,656 queues reported. Wales' three top traffic hotspots were on the westbound M4: Second was at Neath and Swansea East around junction 43, followed by junction 41 at Port Talbot. October, then November - both with more than 3,000 queues each - had the most number of traffic jams because of the bad weather. The M4 in south Wales is synonymous with traffic snarl ups and the stretch around Newport is Wales' busiest length of road. 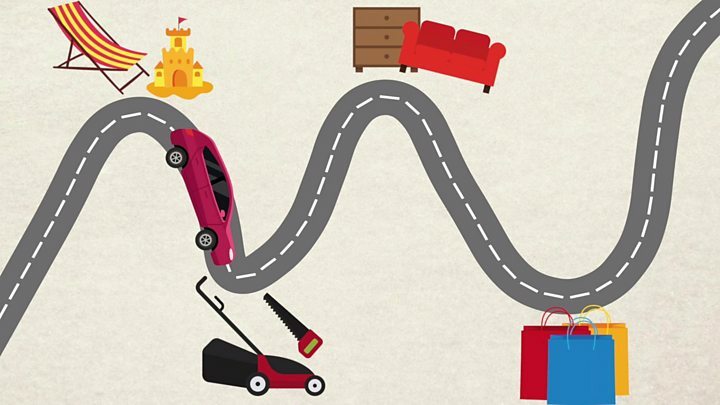 Media captionHow do you avoid holiday traffic jams? 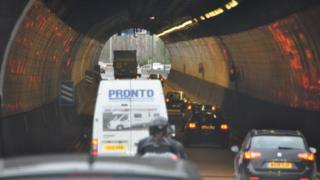 The Brynglas Tunnels is the most-congested stretch of inner city motorway in the UK away from the M25 around London. There were numerous reports of stop-start hold-ups in 2017. An eastbound crash near Magor was the first, in January, while October had two long queues after another accident at Magor and a multi-vehicle collision near Cardiff. But traffic data showed the longest continuous bumper-to-bumper jam was not after one single incident but a "perfect storm" of congestion on the Friday before October half-term. The gridlock made traffic crawl from Cardiff to Magor - from junction 32 to 23 - eastbound on the M4 and started just before 10:00 BST on 27 October. It was a catalogue of unfortunate coincidences which together brought Wales' only motorway to a standstill for seven hours. 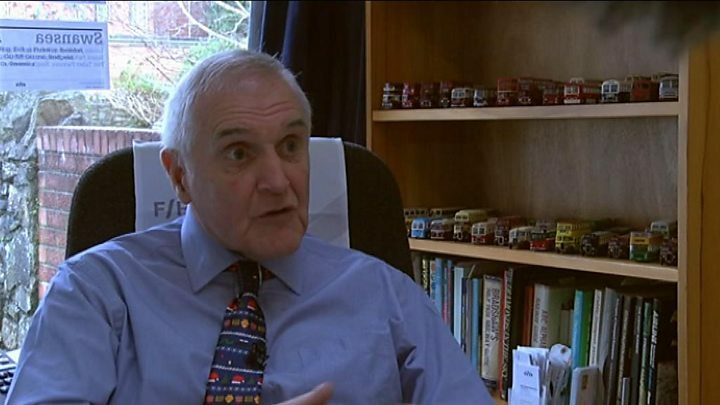 "The reduced capacity and increased demand created a perfect storm for a jam to form," said Dr Cookson. The westbound Brynglas tunnel is Wales' number one traffic hotspot, with 465 jams in 2017 - the worst lasted almost an hour and stretched back four miles (7km). The Welsh Government wants to build a six-lane motorway south of Newport as it says the current M4 around the notorious Brynglas Tunnels is "not fit for purpose". But delays have beset plans to bypass Newport and the proposed build date was last week put back two years while the cost rose to £1.3bn. There is almost one queue a day around the M4's Neath westbound junction near Swansea, which makes it Wales' second worst traffic hotspot - costing the economy £6.5m a year. The most congested stretch of Welsh road away from the M4 was just north of Neath on the A465 Heads of the Valleys road at the Resolven roundabout, where there were 848 reports of queues this year - that is on average more than two a day. The busiest traffic hotspot in north Wales is around the A55 and A494 at Ewloe in Deeside, Flintshire - which will get a £250m relief road to relieve the gridlock - but enters 249th on Inrix's top Welsh traffic congestion list.